. The size of the 1TB memory chip will be the same as a first chip of 11.5*13 millimeters. In addition to offering storage, this new eUFS will be more faster than typical SSDs, microSDs previous chip technology. Users can store up to 26010 minutes 4K UHD Format Video on this smartphones. According to Samsung, Every Users can experience as the notebooks through this new chip smartphone. Samsung going to launch new Galaxy 10 seriez smartphones in the mobile-world congress in Barcelona on 20 February 2019 . According to media, At the same time, 1TB capacity chip will be shared publicly. It is estimated to provide 1 TB storage chip on one of the Samsung Galaxy 10 seriez smartphones with 12 GB Ram. 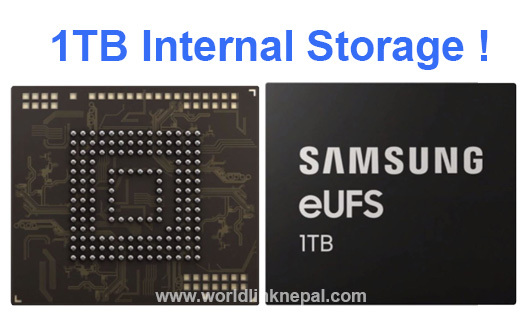 If so, The Samsung Galaxy S10 seriez smartphone will be the first phone with the 1TB(1000GB) internal Storage.